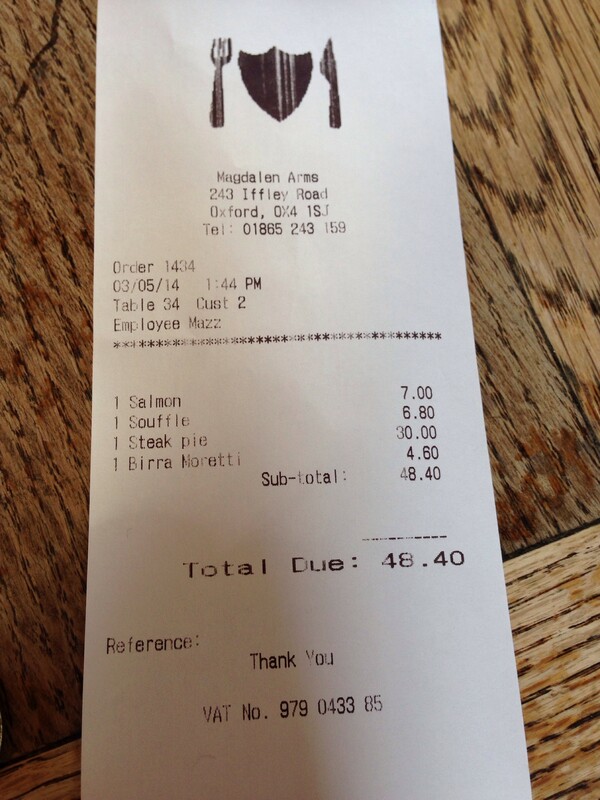 Home » ★★★★☆ » The Magdalen Arms, Oxford. A Life of Pie. The Magdalen Arms, Oxford. A Life of Pie. There is practically nowhere to eat in Oxford. Nowhere good that is. Yes, of course there’s Sojo and My Sichuan, which are both fine and there’s the Turl Street Kitchen, which will do for a snack, but there is very little else. Do not say to me the words Maison Blanc, or Loch Fyne or Covered Market or indeed Quod. They simply won’t do. And the last time I went to Browns I walked out. It’s one of life’s great mysteries, the Oxford food desert. Perhaps it’s some sort of academic badge of honour, a lack of interest in good food, as if it’s slightly distasteful, unseemly, even, amid all that learning. One’s mind fixed on higher things, perhaps. Or maybe it’s just another crap British town, where the food revolution hasn’t quite taken hold. But no-one told them at The Magdalen Arms, because they are turning out food of a quality which belies its understated appearance. Dark claret-coloured walls and a mustard-yellow ceiling are not at the cutting edge of cool and do nothing to alert one to the fact that there is some seriously good cooking going on here. 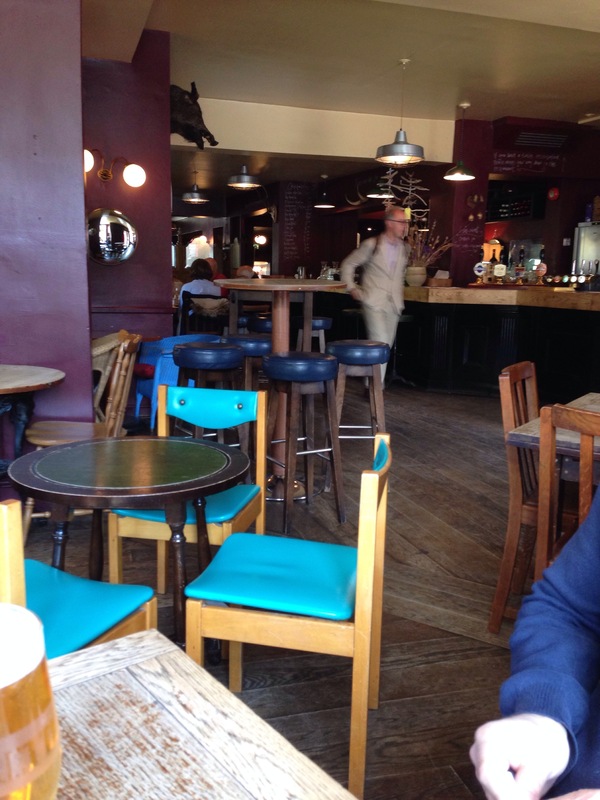 This is, I warn you, not a London-style gastropub. There is no stripped-back brickwork. There are no lights in metal cages or leather banquettes. Shockingly, there is no-one with a ZZ-Top-style beard. And there is a children’s play area at the front. With actual toys. And a big TV screen, playing Sky Sport. Sky Sport, for pity’s sake. Like a real pub. But fortunately it was set to silent and they were playing Creedence Clearwater Revival in the background unlike on my previous visit, when I had to ask them to turn the rugby down. No-one was watching it, other than the chap behind the bar. Yes, I am that woman. Given the décor and the children thing and the sport you might be wondering why I would bother. Three words. Steak. Ale. Pie. And because writing about just the one dish might be a little unbalanced, although not unreasonable, we decided to have some starters. 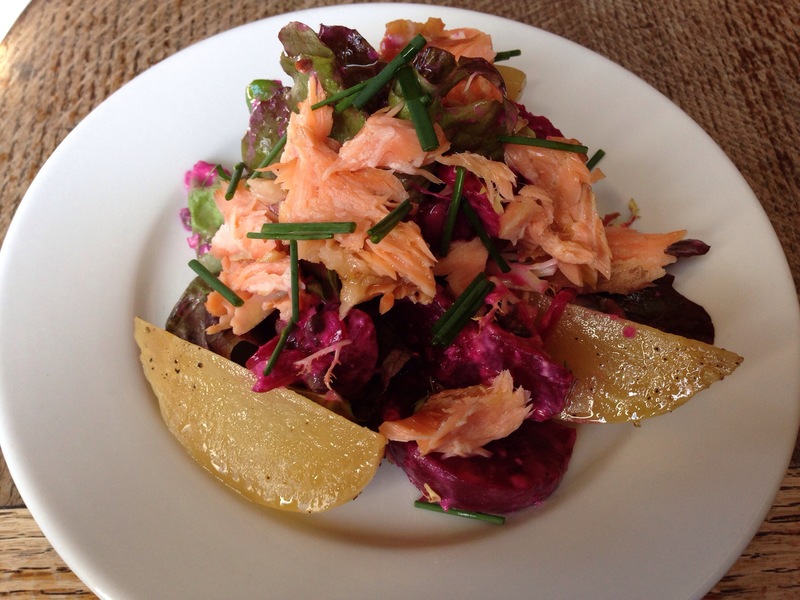 C (for it is he who accompanies me to all Oxford eating outings) went for the hot smoked salmon and beetroot salad. Great chunks of golden and purple beetroot, on a bed of chard and spinach with delicious flakes of salmon and a sharp mustardy dressing. Much better than I thought it would be, he says, wearing his surprised face. 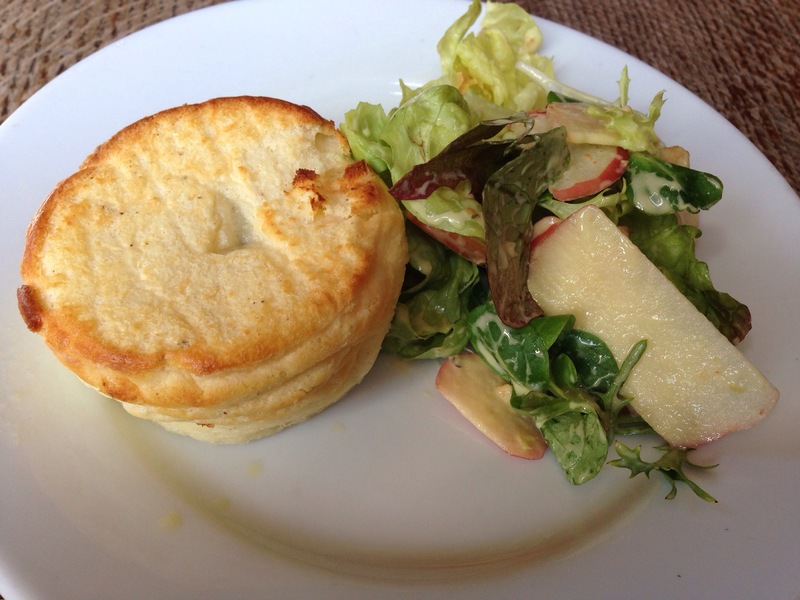 I had the Innes Goat’s cheese twice-baked soufflé, with a side salad of mixed lettuce, crunchy apple slices and toasted hazelnuts. I used the good focaccia as a cheese-chariot, straight into my mouth, elegant as ever. Unlike me this was light and fluffy, with a delicate tang and the centre of the soufflé was oozing, in a good way. The salad was dressed properly and I was grateful, as ever, to see that they had not used friseé, which I always manage to turn into a catapult for dressing, straight onto whatever new item of clothing I happen to be wearing that day. But it was all a delaying tactic for the main event. The pie is advertised as for two to share, but I think they are wrong. The first time I ordered it, I worried that it would not be big enough. It’s a constant worry, that. I had visions of those portion guides on prepared meals I used to look at, when I was a child. Family portion. How we laughed. But they weren’t joking and I hazard that this would feed at least three of me which means four normal adults. Not that I know any, mind. The pie comes in an oval dish. 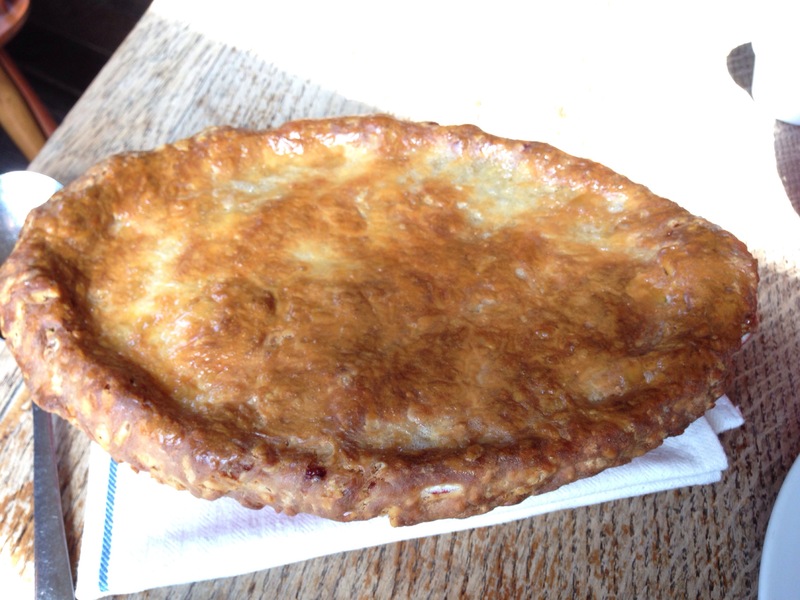 It has a proper suet crust which spills over the edges. It is glazed and shiny. There is a side accompaniment of buttered cabbage, but that is merely a backdrop. 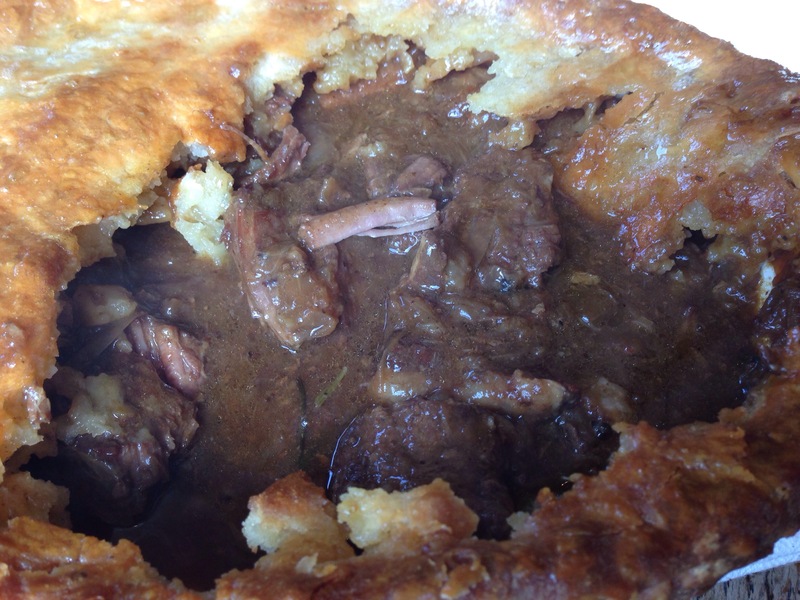 We admire the pie for a short while and I pick at the crunchy bits of pastry hanging over the rim of the dish. It is both crunchy and gooey. It is, for me, the best part. 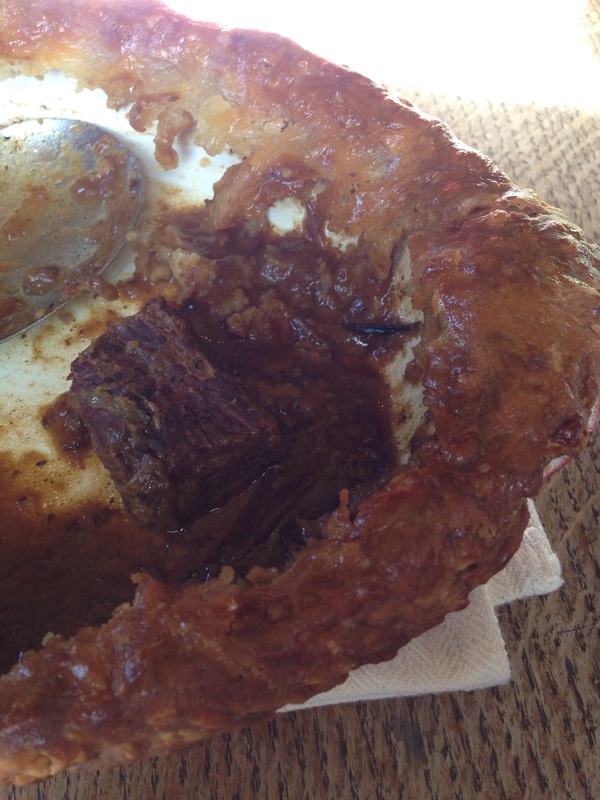 Because C can no longer wait whilst I demolish the edge of the pie, I thrust through the crust, to reveal glistening gravy and huge chunks of steak, which break up as you put your fork in them, collapsing into the rich gravy. The gravy. Rich and spicy, we taste the usual onions and carrots but also rosemary and chilli. Unexpected, but oh so subtle, all of it. A perfect backdrop to the brilliant steak. I see on the next table a good-looking polenta cake and an apple tart but it is no use. My trusty dessert stomach has been hijacked by pastry, which I have worked my way through, steadily, greedily. You would too. I am not suggesting that you drive to Oxford from, say, London, just for this, but if you did, I don’t think you’d be disappointed. Oh and there’s a few world-class buildings and libraries nearby, in case you want to pretend you’ve come for something other than THE PIE. It doesn’t look as good as this. Beetroot and Salmon. “Better than I expected”.The pale thing? Golden beetroot. Pie of joy. Perfect Pie. Note: the spoon on the left is huge. Objects in the picture are larger than they appear. Crust. I ate all of that. We’d already eaten quite a lot by then. I was planning a trip to Oxford with my other half. Having read this, we might have to take someone else with us, purely to share the pie with him, as I am a vegetarian. That’ll make for an interesting weekend. A very helpful waitress explained that the owner was in the kitchen that night, regularly changed the menu and tended not to make pies during the summer months. But I’m pleased to say that it all worked out well. Excellent slow cooked shoulder of lamb shared by 5 of us (it fell off the bone as you looked at it), a salt beef and potato dish which was both very tasty and excellent value at £8.50,first-rate moist ham hock terrine,and lots more. The only comments from the many foodies at the table were pigeon too dry,chocolate nemesis texture not quite right and extra bread-and-butter at £4.50 a time just plain wrong. We’ve just got to have those pies so will be returning as soon as autumn is on the horizon. All we’ve got to do is remember to ask if pies are on that night… Which won’t be difficult.